SEPTEMBER 13--Prosecutors have declined to pursue a criminal case against a Florida woman who was arrested after she struck a fellow competitor in the head with high-heeled shoes during a bikini contest. Erica Kaitlyn Mize, 24, was arrested for battery after tangling in late-June with Sara Shipley, 23. Both women were entrants in the Miss Sailfish Regatta Bikini Contest in Stuart. Mize (wearing cutoffs) and Shipley are pictured at right. According to police, Mize attacked Shipley after the women--and nine other contestants--left the stage in Causeway Park. Several witnesses corroborated Shipley’s account of the incident, and police noted that “Shipley did have a small lump on her head where the shoes had struck her.” A Facebook photo taken after the confrontation also shows Shipley with a black eye. Mize’s alleged weapon--identified as “high heel wooden shoes”--was seized by police. 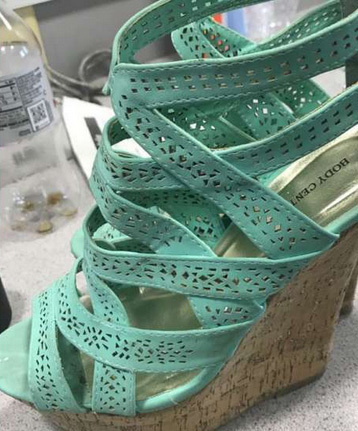 An evidence photo (seen below) shows that the shoes were a strappy turquoise platform heel from the manufacturer Body Central. In a recent court filing, prosecutors disclosed that they would not be pursuing the misdemeanor battery case against Mize, who lives in Port St. Lucie. The document does not disclose why the matter was dropped.